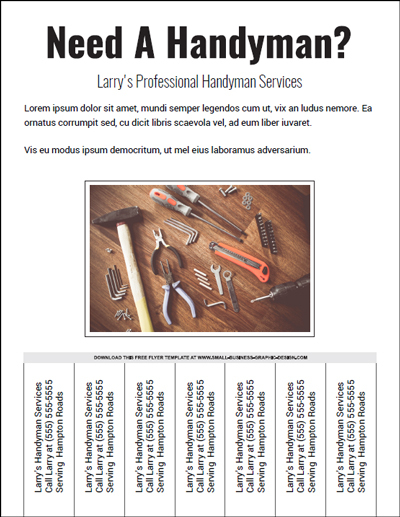 Start marketing your handyman services FAST with this free handyman flyer template. Your handyman business depends on you actively marketing yourself. There's no better way to do that than by using flyers. Homemade printable flyers are the most affordable way to get started. That's why I've created this free downloadable template. Receive this for FREE when you subscribe! 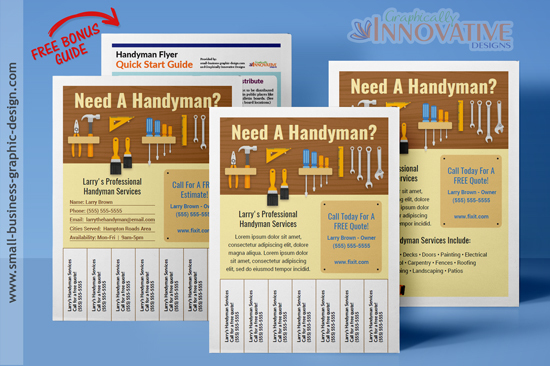 By simply signing up to my e-list about inexpensive and free handyman flyers you will receive a link straight to your email to download the template. You'll be able to save it to your computer, add your information and print as many as you need using your home printer. My flyer is absolutely hassle-free because you don't have to buy any extra programs to use this template. This is a preview of how your flyer will look using the free template. All you need is a program that just about everyone has one their computer - Adobe Acrobat Reader. If you don't have it, you can download the latest version for free on Adobe's website. There are 3 editable fields on this template for you to add your information. You can edit the tab areas, the secondary headline underneath "Need a Handyman?" and the main message above the photo. The photo of the various tools sitting on a wooden background is included in the design. 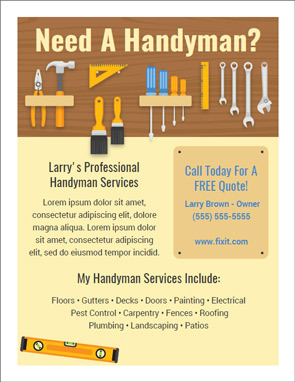 I sell premium handyman flyer templates that are a step up from the basic design. The functionality is still the same, so that means it's just as easy to use as the free flyer... but the upgraded design sets it apart. You can buy these flyers separate or as a bundle. The bundle comes with a free bonus guide that gives you handyman specific marketing tips such as suggestions for what to write on the flyer and where to distribute them. Learn how to get help paying for your next website design through local E-Commerce Grants in your area, and specifically in the Hampton Roads area of Virginia. The City of Newport News is offering to pay for part your web design costs. Learn more about the Newport News E-Commerce Grant. Use this quick checklist to choose a great domain name you won't regret - because no one wants to experience buyer's remorse. Copyright © 2009-. Graphically Innovative Designs. All Rights Reserved. Graphically Innovative Designs is a Virginia based, small business marketing and graphic design business. Serving the local Hampton Roads area including Hampton, Newport News, Yorktown, Poquoson, Williamsburg, Norfolk, Smithfield, Suffolk, Portsmouth, Chesapeake, Virginia Beach and nationwide.